I think yellow might look good on me. The big development this week on Survivor was Stephanie effectively telling Boston Rob at Redemption Island arena that she and Krista would flip to the Ometepe side after a potential merge. Whether this was a savvy idea or not is certainly up for debate. On one hand, what does Stephanie have to lose? As we found out later in the episode both she and Krista have virtually no chance of reconciliation with the six member alliance dominating their tribe. What if there’s some bizarre twist where Ometepe gets to pick two or three Zapatera members to join their tribe and vice versa? Boston Rob would know not to pick Krista and Stephanie because they’d ally with whatever Ometepes went to Zapatera. Because the scenario I present above is far-fetched and unlikely, I don’t see what advantage Stephanie receives by revealing her predicament. 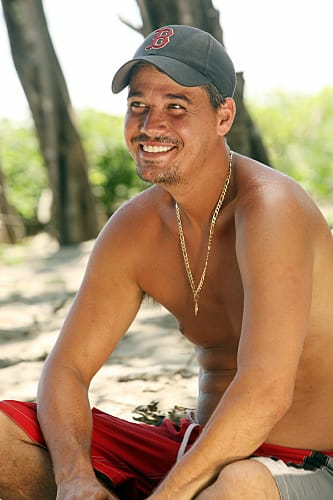 Are Boston Rob and Ometepe more likely to believe Stephanie and/or Krista when they come to them at the merge and offer to switch after indicating as much at Redemption Island? If their side was down, who wouldn’t accept such an offer from Stephanie regardless of if it seems suspicious? The one man who continues to keep his mouth shut at all the right times is Boston Rob. I was very impressed with how deftly he managed to deflect attention off of him at Redemption Island. Matt and Jeff really put him on the spot about Matt’s ouster, but Rob kept people guessing by insinuating that he was not solely responsible for someone getting voted out. Earlier in the episode Rob talked about how keeping Philip around, no matter how annoying he is, was potentially beneficial because it kept the spotlight off of him. This understanding of what power really is separates Boston Rob’s game from that of Russell’s and is why Boston Rob is still in the game when Russell has been sent home. Russell was obsessed with people knowing he was in charge. Boston Rob only cares about using his power to advance his own cause. Deception is an important part (if not the most important part) of Boston Rob’s game so I was surprised to see him take a huge risk by switching the clues for Grant. Similar to Stephanie’s rant at Redemption Island, I don’t see what it accomplished for Rob. He knows Grant can not find the idol no matter how many clues he has. Does he want to hide the fact that anyone has found the clue, lest they think it’s him? Remember Kristina found the idol without any clues and Ometepe knows that. Even if Grant or someone compile enough clues to determine where the idol was and realize it’s gone I find it hard to imagine they’d peg Boston Rob being the one who has the idol. Keeping the perception that the idol is still in play at the risk of Grant discovering Boston Rob is not only hiding the clue, but a lot more did not seem worth it. Russell’s exit from the game was more dramatic than Kristina’s, but not by much. Zapatera made the right decision getting rid of Krista over Stephanie. You can tell Stephanie has the energy and enthusiasm to compete in challenges. Krista brought nothing to the tribe. Very interesting to learn that Andrea is on the outs with Ashley and Natalie and knows it. Even if Matt doesn’t come back, she’s found a partner with Philip. I think this means Ashley and Natalie have fallen to #4 and #5 in the Ometepe tribe because Philip can now lobby Boston Rob with Andrea’s vote in hand. I disagree with Krista that Zapatera should be playing the game the way she envisions, but they’re definitely not as focused as Ometepe. Krista is right that when the game forces them to play they’re going to be shocked.